Merit™ Sterile Kelly Hemostatic Forceps are primarily used for clamping large blood vessels or manipulating heavy tissue. 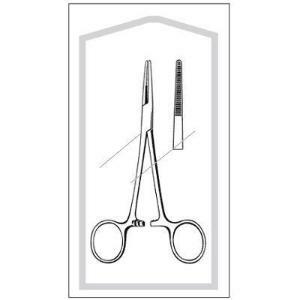 The forceps may also be used for soft tissue dissection. They are available curved or straight with a ratcheted finger ring handle. The jaws of Kelly Forceps are 1/3 the length of the shanks and serrations are 1/2 the length of the jaws. Merit™ Sterile instruments are ready-to-use, sterile, disposable, office-grade instruments sold in bulk quantities.